Stairlifts don’t have the wear or abuse of motor vehicles so buying used is a safer option. All our used stairlifts are serviced and any faulty or damaged parts replaced. 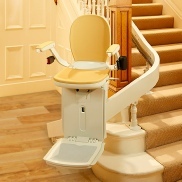 If you are considering purchasing a stairlift it may be you have not yet considered buying a used stairlift. Even if you had thought about this option you may have dismissed the possibility because of concerns about the age of the stairlift or the condition it maybe in or even how much use it may have had. Age - You may be wondering how you will know how old the stairlift is because unlike a car they don't have a number plate to identify the age of the stairlift . (But by the way some do have a manufacturer's build date stamped on them but not all). Sometimes we are given the purchase and install paperwork by the previous customer but not always and it is not always clear if the lift was fitted as a new lift. So how do we know the age of the lift that we are selling on? We have have any easy solution to problem. As we are main dealers for most of the manufacturers we can simply call, give them the serial number and they will give us the date of manufacture. We then know roughly within a few months how old the stairlift is. Please note a new stairlift could be in stock with a dealer anything from one week to possible 6 months so this is only a guide but it is fairly indicative of the age and as we will go on to explain age normally much less of an issue than say buying a used motor vehicle. Condition - most stairlifts we receive are in very good to excellent condition and need very little aesthetic work. Even so if any body panels or the seat are damaged we will replace them as part of our refurbishment process. We aim for the stairlift to leave our facility looking as near new as possible. You will also get a copy of the handbook and at least one remote control to call the stairlift down the stairs if there is more than one user. We are confident you will be delighted with the condition of our reconditioned stairlifts. Previous Use - unlike cars, bicycle or motorcycles stairlifts can't be driven at speed, driven up kerbs or too fast over sleeping policemen! They simply travel up and down a track on a aluminium rail. There also have a soft start and stop mechanism built in to stop sudden movements for those with chronic conditions so they simply have very little heavy handed use. It is almost impossible to ride a stairlift recklessly! For this reason there is far less to worry about when it comes to the use by the previous owner when buying a second hand stairlift compared to buying a second hand car. Testing and Service - all used stairlifts are tested fully for safety and functionality in the first instance. They are then serviced to the manufacturers' specification. Any defects found are corrected. You don't want the stairlift breaking down, we don't either! Warranty - Finally to give you total piece of mind and to give you further assurance we fully warranty the stairlift for 12 months. This covers parts and labour and is the same warranty you would get if you bought a new stairlift. Nothing is left to chance. We hope this covers any questions or concerns you may have had when considering buying a used stairlift but please don't hesitate to call us and discuss the matter further. Call us free on 0800 977 4688 and we can arrange for you to talk to one of our surveyors and we would be happy to give a free no obligation survey too. Thank you for taking the time to discover the benefits of a reconditioned stairlift.